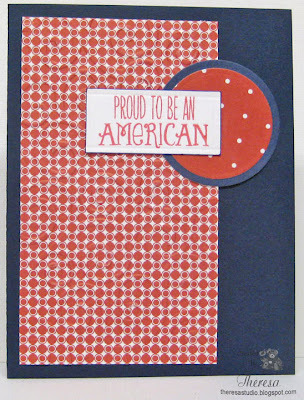 One more post today: Another Red, White, and Blue card for some more challenges. 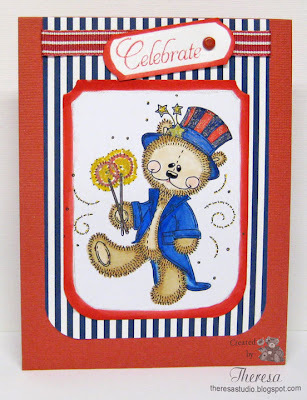 I am using one of my very favorite Meljens Designs, Patriotic Bear, who is all dressed for the 4th of July Celebration. I used the sketch from Tuesday Mornings challenge which I made vertical rather Horizontal. I colored Bear with Copics and added some glitter and shine. I edged the image with a marker and placed on a Striped Mat and then on Red card base. Finished with a Tag attached to a ribbon with a brad. The Outlawz: 2000 Member Party Color Party Challenge-We would like to see you use the colors of your country, state, province, street or something that represents the colors from where you're from. Kaboodle Doodles Challenge: Use colors of your national flag. Digital Image: Meljens Designs "Patriotic Bear"
Something about this CPS Sketch called out Red, White, Blue this week. Maybe because I had these cardstocks on my work table? And I have been making 4th of July cards? 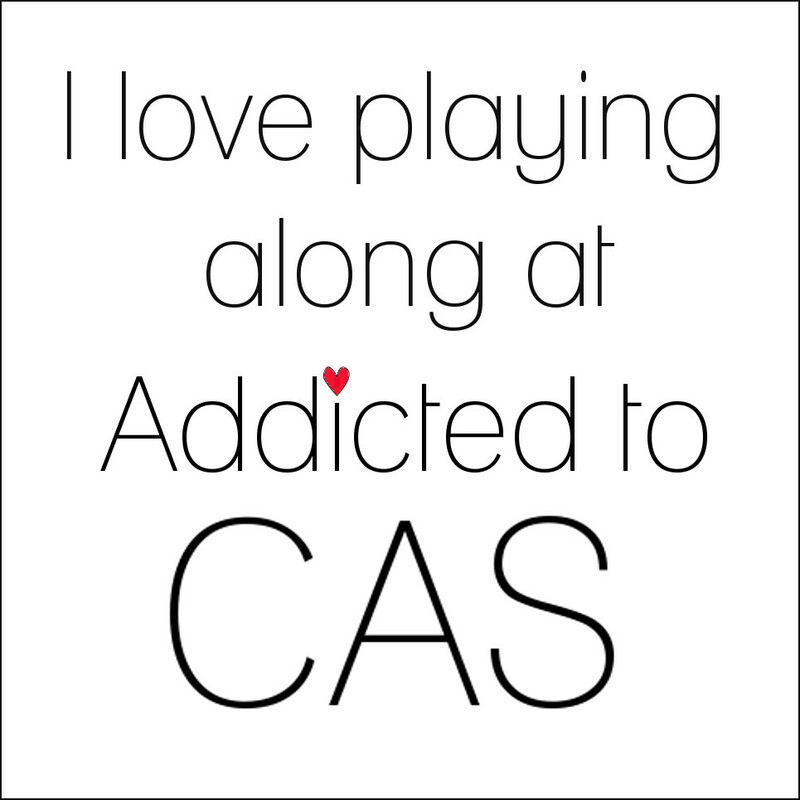 I cut 2 circles, stamped a verse on a simple rectangle, trimmed and embossed a mat and put it all together to make this CAS Card. Welcome to another Speedy Fox and Friends Challenge. This week we are asking you to use metal on your project. 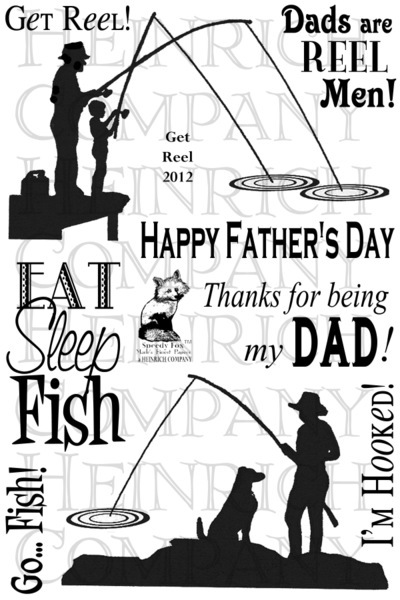 I just love the stamp set "I'm In Stitches" recently released by Mark's Finest Paper and Stamps, a Heinrich Co. The tomato and strawberry pin cushion is so cute and reminds me of the one I have and still use. I gathered up some of my sewing items -pins, needles, threads, spool charm, and thimble charm and combined with some old papers to make this card. One of the Pattern Papers I used is an old pattern design. 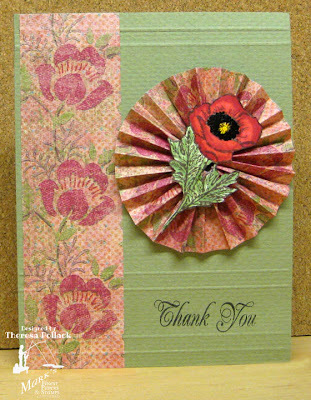 To assemble the card, I stamped the pin cushion with red ink and added some green. I cut this out and covered with Matte Accents. Started with Green card base, added polka dot mat edged with pinking shears, and layered with the "Pattern". Stamped the sentiment and tape measure. Attached the pin cushion with foam dots along with the metal charms to top. I finished with the pins and needles and thread....now all ready to sew. Crafty Catz: Show us your metal. Stamps: MFP's "I'm In Stitches"
Please join in the challenge this week for a chance to win a MFP stamp Set. You have until 3PM on Friday July 6, 2012 to post your card. Remember, if you use MFP, a Heinrich Company stamps your name will be entered into the drawing twice. 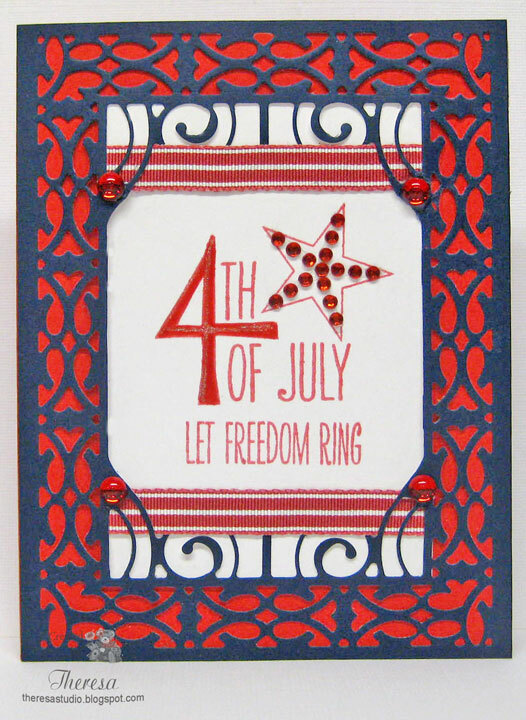 With July 4th approaching, there are a lot of challenges to make patriotic or red,white,and blue cards. Also The Outlawz is celebrating having 2000 members with special challenges to make cards to show our country and colors. On this card I have featured a Meljens Design that I recently won "USA Granny Bear". I dressed her up in Red, White and Blue using Copics. I followed a Sketch Design from Sweet Sunday with Patterns Papers in the same colors. Added some ribbons, a star brad, and felt flower. The Meljens Sentiment says it all "Proud to be an American". The Outlawz : Copic/Promarkers Party Challenge "Where in the World"... create a project that represents where you live now or where you are from. Anything Goes Challenge: Polka Dots with a Birthday Theme...may be stretching this but it is a birthday card for our nation on the 4th. 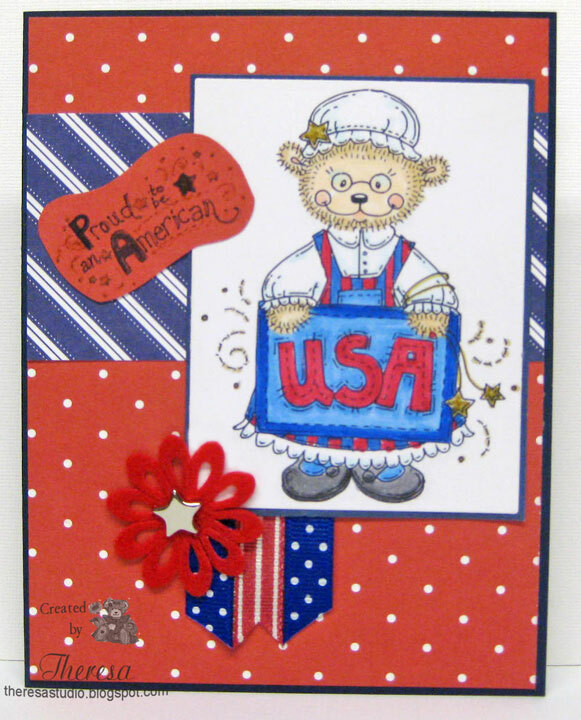 Cute Card Thursday: Challenge is Patriotic. Hope you join in some at the fun at The Outlawz". The Celebration has been extended to July 5. 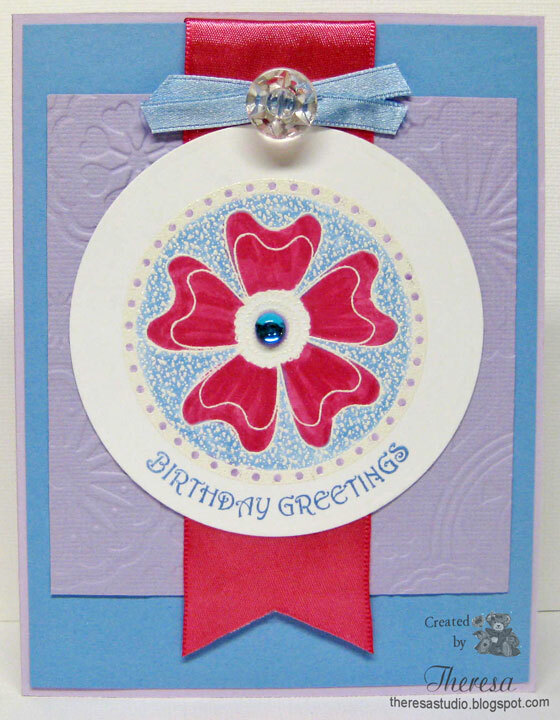 At Sugar Creek Hollow this week, the challenge is to make vintage, shabby chic or primitive cards with CIRCLES ...can be a circle shape or can be another shape that features circles or circles on a circle shape - you decide. I thought of some great vintage pocket watch digital images that I have and decided to feature one from Graphics Fairy on my card. I took my color inspiration from a pattern paper that has a vintage flavor with a design in browns, pink, and a limey green or what might be called chartreuse. I followed a sketch from Crazy 4 Challenges. The band of the pattern beneath the circles kind of got lost in the Card Base...BIRL. Hope you can make out the layout of the card. Crazy 4 Challenges: Use sketch shown below. Stamp: Flourishes "Moments in Time"
I took the sketch from Meljen's challenge and turned upside down to make this card. 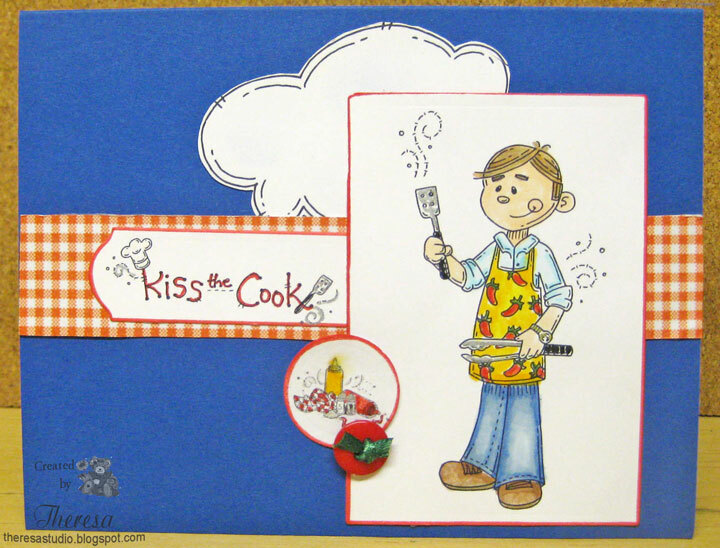 I used 4 digi images from Meljens - Smoking Hot, Kiss the Cook, Clouds, and BBQ Fixings. Colored with Copics E0000,00, 31,33,34,44. B000,01,24,26,93, Y02,17, Memento Lady Bug and Bamboo Leaves, and metallic gold and silver pens. Papers used were Blue and White CS and scrap of gingham paper. Finished with red button and scrap of green ribbon. 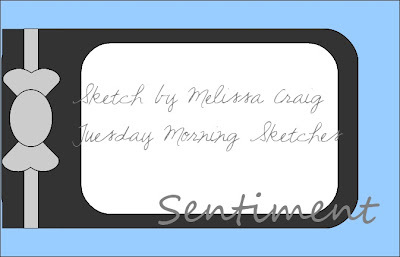 Meljens: Use sketch shown above. 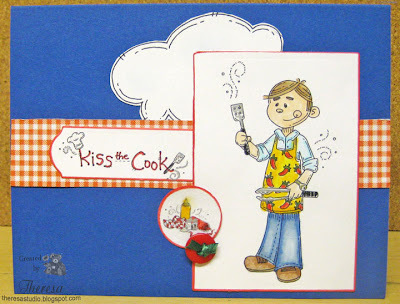 Cute Card Thursday: Use summer theme. 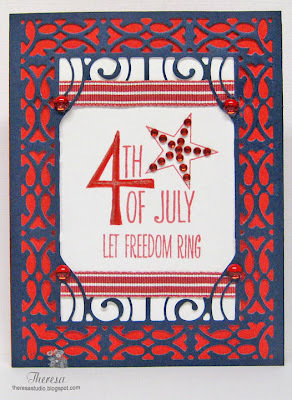 Friends of Speedy TV are challenging you to make a 4th of July card for this week. In anticipation for the holiday that will be arriving soon, I always think of the fireworks that we will be enjoying in the night sky. In my scene to inspire you, I have depicted the sky ablaze with fireworks near a lighthouse on the coast. We may not be near a coastline but the sky will be just as much fun to watch. I do not have stamps for fireworks but I improvised using the centers of a stamp from MFP's Black-eyed Susans to create my explosions. 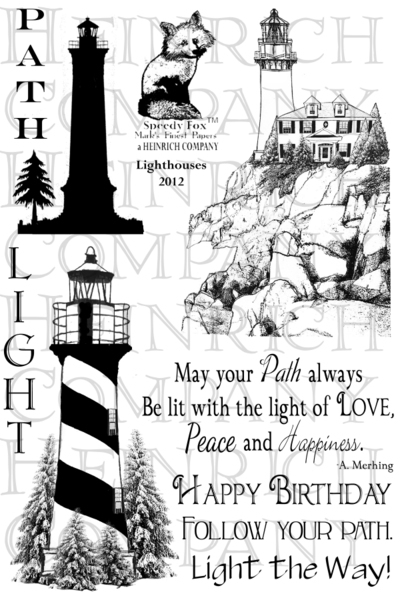 I made a similar card last year but I used stamps of mums for the effect.I stamped the lighthouse scene from the newly released MFP's "Island Life" stamp set, colored with Copics, cut out and place on Dark Blue CS. To this I attached the "explosions" that I stamped with Versamark on the dark blue CS, embossed with Gold EP, and cut out. 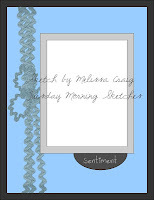 Did sentiment with "Happy" from MFP's and wrote in "4th".This was attached to a base card of Red CS. 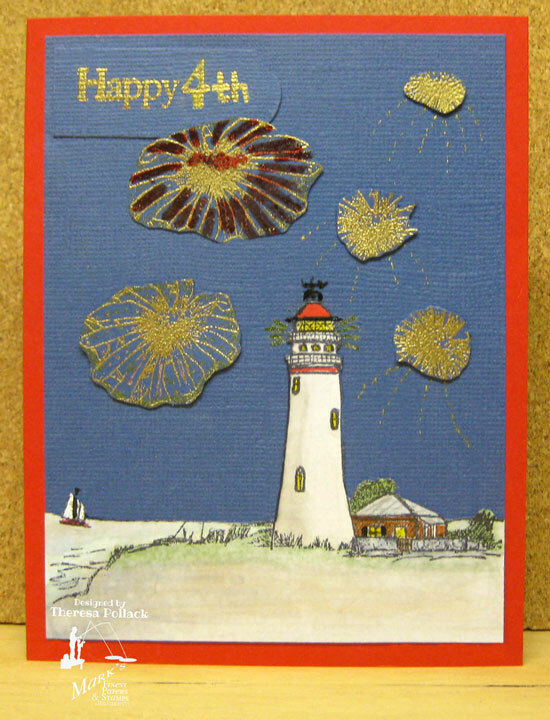 Stamps: Mark's Finest Papers, a Heinrich Co."Island Life", "Black-eyed Susans" and Happy from "Greetings of the Season"
I made this card for the challenge at Cheery Lynn challenge to use Red, White and Blue. 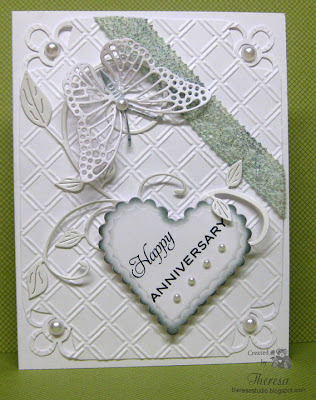 I used the Cathedral Lace Frame die that I cut in Blue card stock and cut out part of the center area and placed with a white card stock stamped with Verve Stamp American Hero. I added some red and white stripe ribbon and then attached to a card base of red card stock. I added red rhinestones to the star and some red sprinkles just above the ribbon. All Sorts: Any die will do. Welcome! Our challenge at Speedy Fox and Friends this week is to use Score Lines on a project. I hope you find some new ideas to try from our talented team. I decided to make a circle using a 1.25" x 12" strip of paper and and scoring it to form a circle to showcase the Poppy that I stamped, colored with Copics, and cut out. This is a stamp from the recently released Mark's Finest Papers, a Heinrich Co. called "Welcome Poppies". I also used the beautifully scripted "Thank You" from the same set. I used another strip of the Pattern Paper along the side of the card. I thought the colors and design of this pattern complemented the Poppy design. Before assembling the card, I scored some lines to add interest and texture.....this such a simple and easy step but adds so much. This is really a one layer card but has so much depth with the use of scoring and the addition of the scored circle. Stamps: Mark's Finest Papers, a Heinrich Co. "Welcome Poppies". 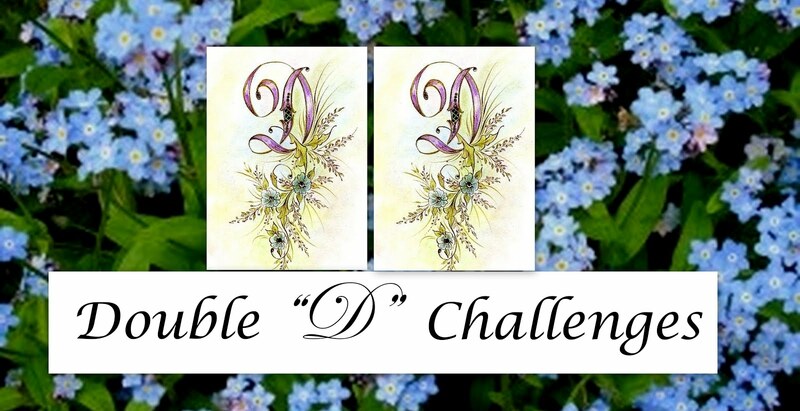 Please join in the challenge this week for a chance to win a MFP stamp Set. You have until 3PM on Friday June 29, 2012 to post your card. Remember, if you use MFP, a Heinrich Company stamps your name will be entered into the drawing twice. 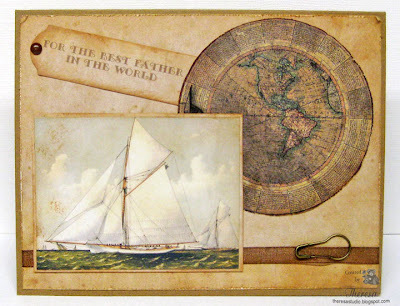 The highlights of this card are a beautiful Graphic Print from The House on the Bay, an "antique" (?) button engraved with flowers, and an "antique-looking" crushed velvet ribbon. 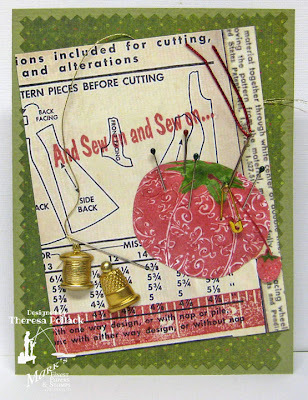 I used these items plus several more to create a card for this week at Sugar Creek Hollow for their theme More Is Better. 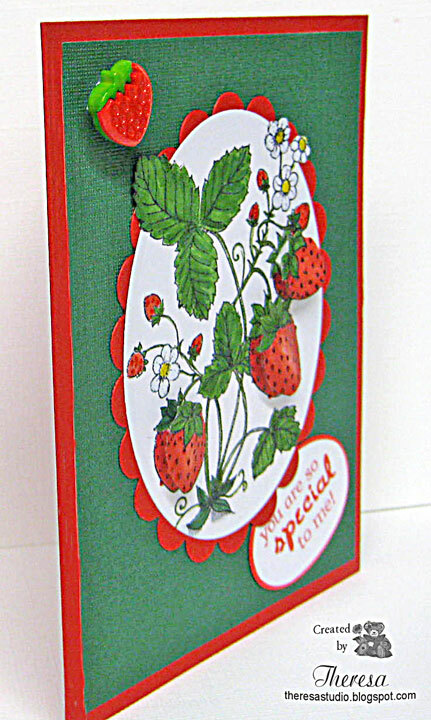 Our vintage, shabby chic or primitive cards should have lots of embellishments! 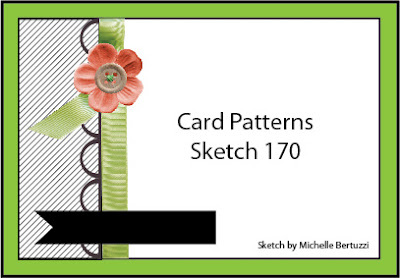 I followed a sketch from Card Patterns which I turned on the side for my design. 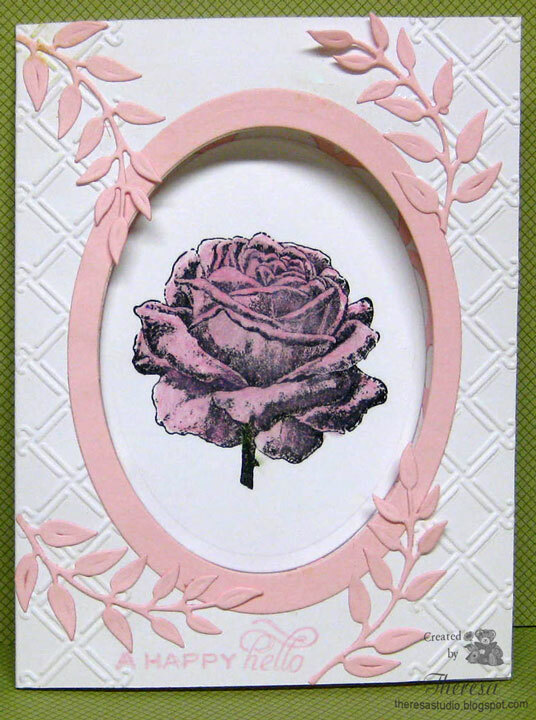 I made the focus of the card the graphic - Rose with a Border which I distressed the edge and aged with Distress Ink. I placed this on an embossed dark green mat, added border of pink pattern with pink crushed ribbon and green satin ribbon. 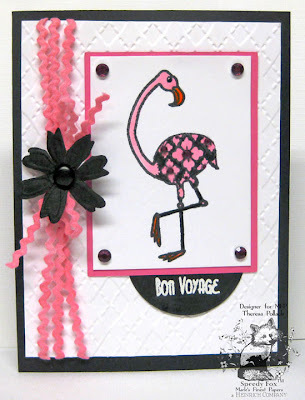 This I placed on a card base of Distressed Pink CS. I finished with Pink Rhinestones in a design about the roses, added pearls, and the button with flower design and a rhinestone center. Added the word "Love" embossed in gold. Sugar Creek Hollow: More is Better. Digital: The House across the Bay free from Papercraft Star. I do hope everyone is keeping cool this week So many areas in the US are experiencing very hot temps. 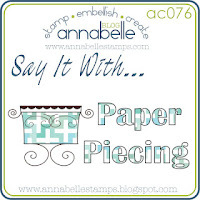 This week at Annabelle's they are having a cool challenge, Say it with...Paper Piecing. 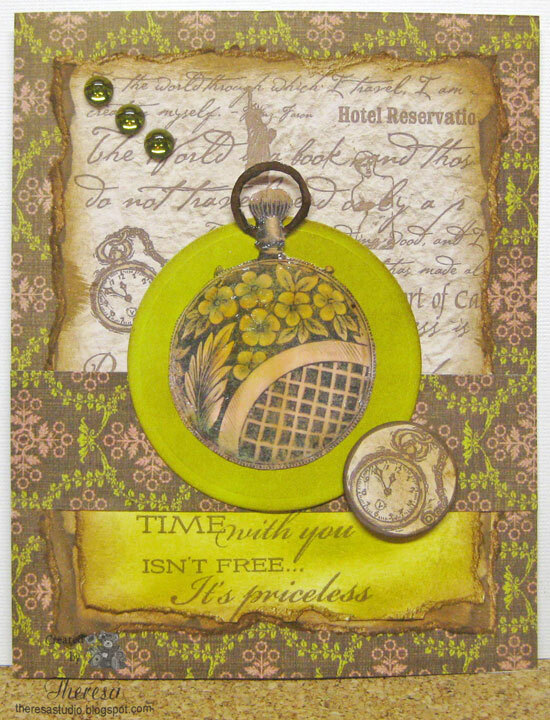 I stamped one of her "Squared Posies" using Memento Rich Cocoa ink on soft Sand CS as well as 3 other papers -2 BasicGrey prints and 1 yellow scrap. Cut out the design and adhered to my card. Used Soft Sand as card base and a mat of green. Stamped a sentiment from same set. Finished with Satin loop ribbon and Annabelle sprinkles. 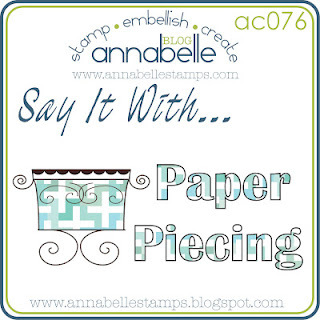 Annabelle: Say it with...paper piecing. Keep cool out there if you are in a heat wave. 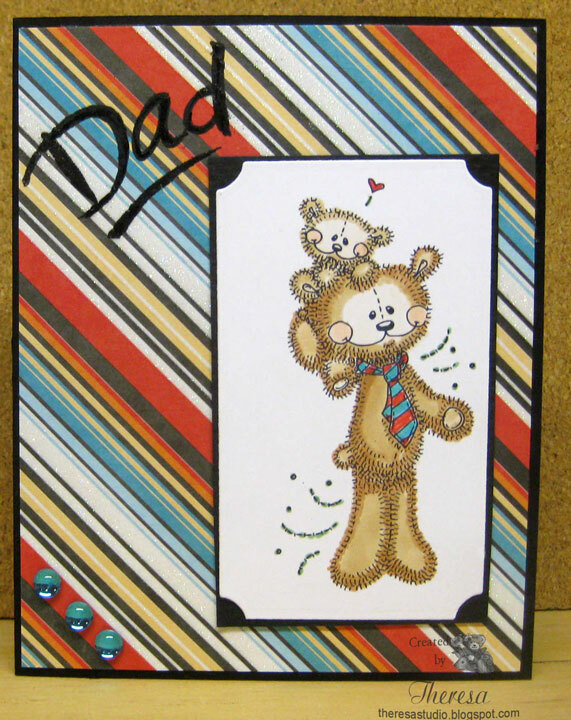 For Meljen's Challenge I used "Pappa Bear" to make a Dad Card. After printing the image I colored it with Copics and matted on black to look like a photo mount. Found the stripe pattern and picked up colors for the tie. "Dad" is an old PSX stamp used with Versamark and Black EP. Finished off with Aqua Blue sprinkles from Annabelle. Glitter Stripe is from DCWV Tahiti Beach stack. and more days when everything goes your way. I thought this went well with the serenity of my card. Summer is the challenge theme this week at FOSTV. When I think of summer I think how fun it would be to spend time on a sailboat but we do not have one so I am just dreaming about Summer by making this card for inspiration. I used a New Stamp soon to be released by Mark's Finest Papers, a Heinrich Co. 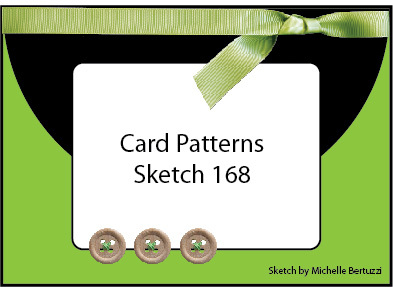 It was so easy to make this card because it is finely detailed and fun to color. I colored the buildings with bright colors as if the boat is docked on a Caribbean Island. And I personalized the boat in a special way---do you notice?? The scene looks like a water color and more so because the paper has a grainy look. What are your summer dreams or fun realities? 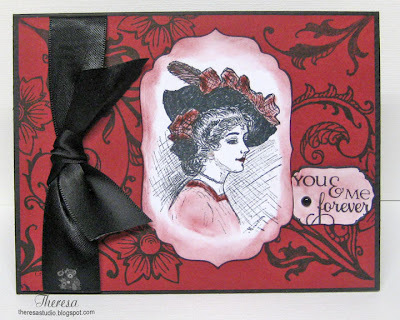 The Speedy Fox and Friends Challenge this week is to make a Vintage card. 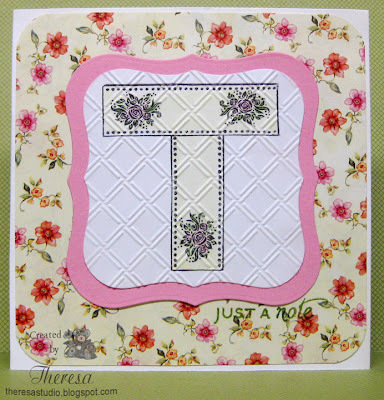 For my DT inspiration card, I used a new stamp set called "I'm In Stitches" soon to be released by Mark's Finest Papers, A Heinrich Co. 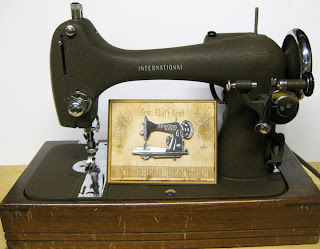 I love the stamp of the old Sewing Machine and was anxious to ink it up. I stamped it on White CS with Versamark and embossed with Black EP. I colored the metal parts with Silver Pens and then fancy cut the image...that was the hard part! Glad I have good scissors. I used Brown CS as a base card, attached a camel colored mat , and then a mat of Digi Paper "Old Paper" downloaded from Graphics Fairy. Before placing the PP mat, I distressed the edges with a distressing tool and sponged with Distress ink and stamped the sentiment on the top and the tape measure across the bottom with Distress Ink. The dress forms were a part of the digi paper. Stamps: Mark's Finest Papers, a Heinrich Co. "I'm in Stitches"
Personal note- I love this stamp set because it reminds me of sewing machines that my mother and grandmother used and a machine (a collector item, I'm sure) my Aunt Julia gave me a few years before she died. I decided to pull it out of its case and share a picture. The warranty is dated August 1949. Please join in the challenge this week for a chance to win a MFP stamp Set. 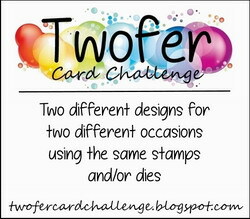 You have until 3PM on Friday June 22, 2012 to post your card. Remember, if you use MFP, a Heinrich Company stamps your name will be entered into the drawing twice. 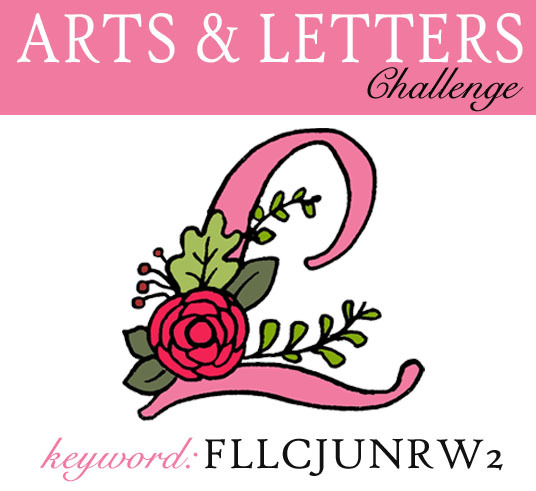 At Flourishes,for their noon challenge “Arts and Letters” all we need to do is create Art… with Letters! I kind of went off the wall or out of the box for this one. 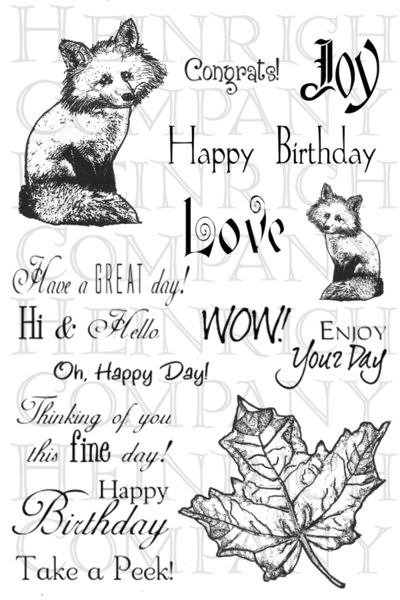 I wanted to use a Flourishes stamp but I have no letter stamps from them ....so I just created a "T" by using a Pennant stamp from "Birthday Pennant". I stamped the pennant 3 times masking as I went to form a "T". Used my Monogram to make a personalized note card. Used Sentiment from "Taglines". Personal Note: What the!!!! What is Blogger up to now???? I could not post using my current browser!! Blogger said that now I have to us Chrome! I posted this using Firefox which I never used before but had downloaded as a backup when I had problems before with Blogger? I am comfortable with my current browsers and have it set with my favorites, web sights,etc. Why do they have to keep changing and upsetting our routines??? Thanks for letting me vent. 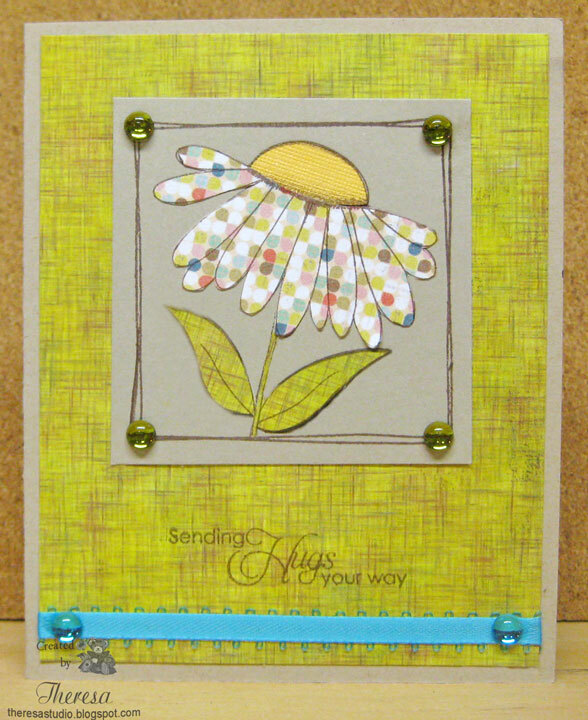 It is a challenge for me to make Vintage cards but I think I am getting more comfortable doing them through the challenges at Sugar Creek Hollow. 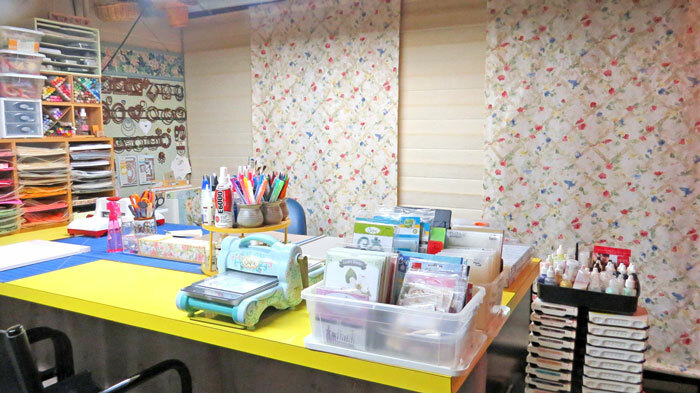 This week at Sugar Creek Hollow we are asked to Make our own Designer paper. 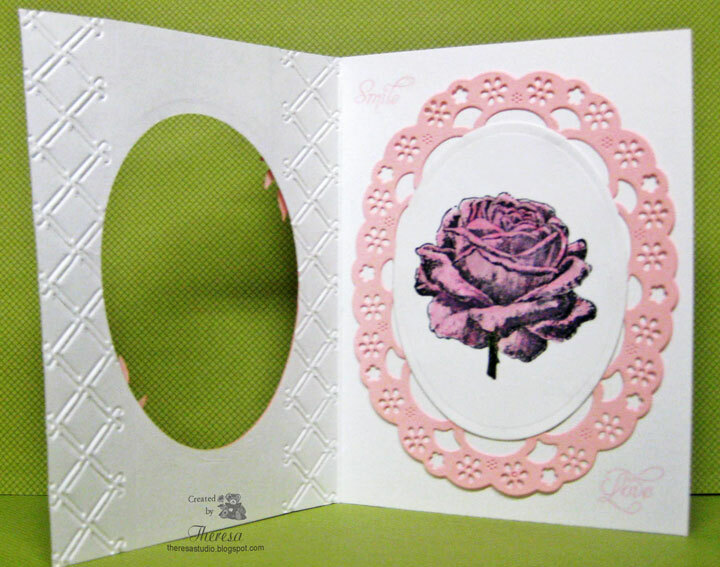 Our vintage, shabby chic or primitive cards must feature at least one piece of designer paper that we have created. For this card I started by making the DP with no plans for the final design....kind of a backward approach. I usually start by selecting my image to focus on. Using a deep red CS from my stash, I stamped a flourish and flower from Layers of Color Art Stamps Set "Nature" several times with Versafine Onyx Black. When I was satisfied with my DP design, I went hunting for an image. I found this lovely portrait "Gibson Girl" in my collection of Digis from House Across the Bay that I found in freebies at Papercraft Star. I printed the image as is and added a bit of color with Distress Ink Aged Mahogany. I cut it out with Nestabilities Labels 4 and sponged the edge with the Distress Ink and added a black edge. 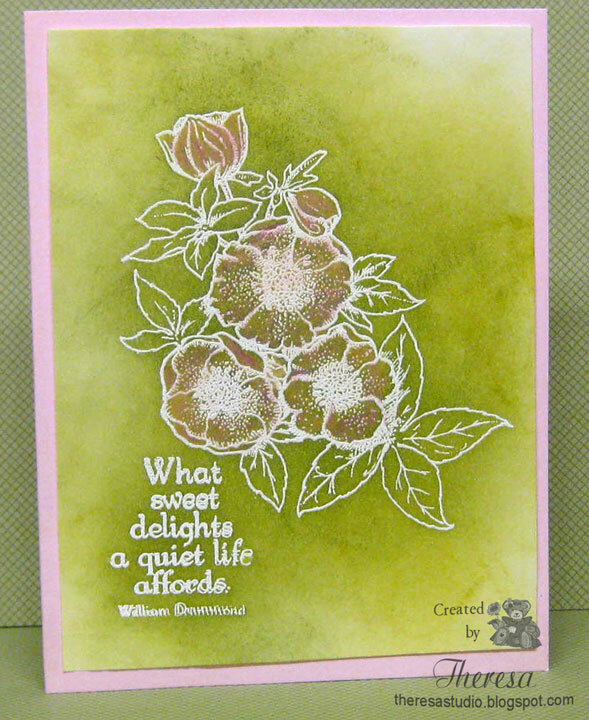 Stamped sentiment from Flourishes "Sweet Love" and cut with same die set mentioned. Assembled the card with Black CS Base, my own Designer Paper as the mat wrapped with Black Satin Ribbon and my stamped image and sentiment. Finishing touches were a black pearl and rhinestone as her earring. ( You may have to enlarge to see that touch.). I like the final results of my unplanned card. Ribbon Girl: Monthly Challenge - Use ribbon. Here I am with another post! I am determined to win the Flourishes June release...can you tell? I am doing everything that I can do by entering all their challenges. To play in the “Pop It” challenge, all you need to do is pop up a portion of your creation with dimensionals or foam tape. Entries must be in before Friday, June 15th at 5PM EST, so here I am with my card. I used Flourishes Strawberry Stamp set that I stamped with Memento Tuxedo Black on white CS and colored with Copics. I cut the image with a Nesties Oval letting some of the image extend out. I matted this on a red scalloped oval. 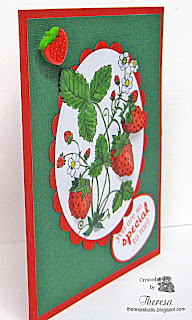 Stamped the strawberry image again and cut out 3 strawberries that I colored and attached to the image with 3D Foam squares. Used card base of red CS, added textured green CS mat, and image. 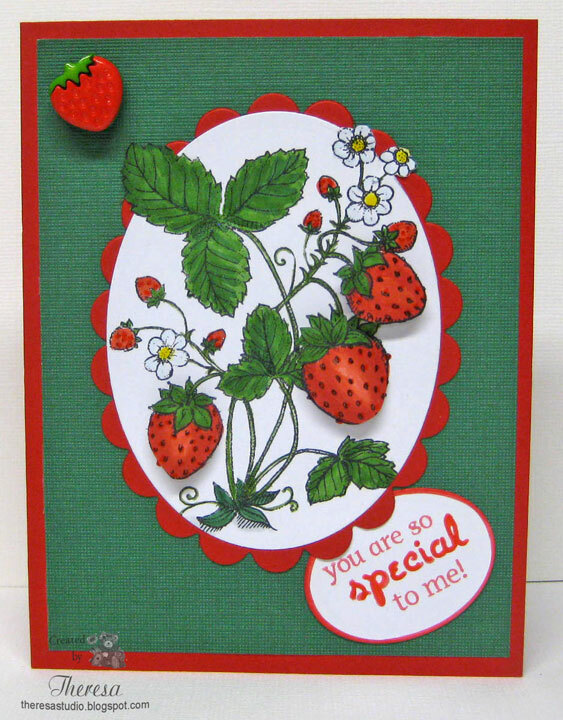 Finished with a Strawberry Button and Sentiment from same stamp set. I finished by adding Red Dots to seeds with a glaze pen and glaze to the flowers with Yellow and White Glaze pens. The bottom photo, a bit fuzzy, shows the Pop Up of the strawberries. Second post today. 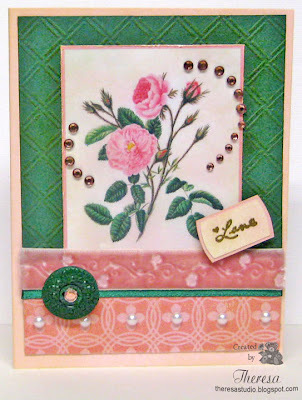 I am back with another 10 minute card for the latest Release Week Challenge At Flourishes. It’s one that gives you a chance to WIN their entire release for June! Check out the details here. For my CAS card that I made very quickly, I used a resist technique using a heat embossed image and sponged with distress inks. 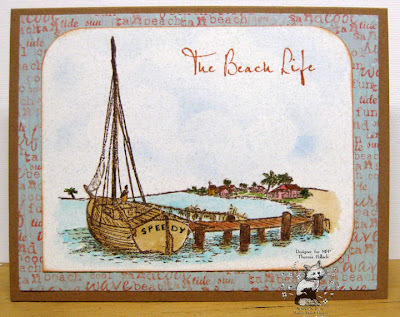 For this one I made a beach scene using Flourishes "Beach Life" stamp set. I stamped with Versamark and embossed with Zing Chestnut EP. Using some masking, I added Distress Ink Broken China and Tumbled Glass for the sky and Antique Linen and Tea Dye for the sand. Added a bit of color to the image with pencils. Had time to add brown brads for coconuts. 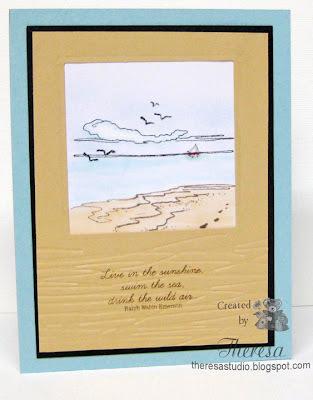 Used Soft Sand CS for card base. 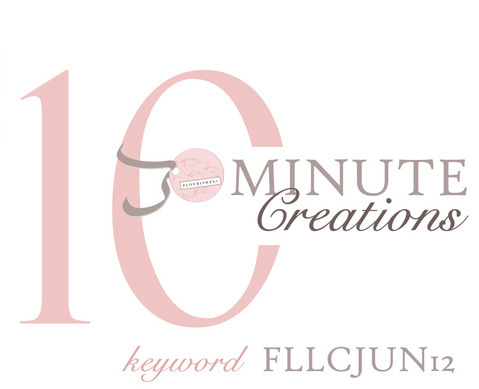 Congratulations to Julie on 5 Years of blogging and all her inspiration. Thanks for stooping by today. 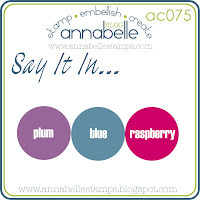 This week Annabelle Stamps is sponsoring the challenge at Card Patterns so I combined these challenges into one card...a color challenge and a sketch challenge. Colors in card match challenge colors better in real life...could not get to show as well in photo. Stayed very close to sketch layout. Stamped image in Versamark and heat embossed with White EP. Colored design with makers, cut out with circle die, and stamped sentiment with blue ink. Finished with layers, ribbons, and button. Second Row across Buttons, Ribbons, die cuts. 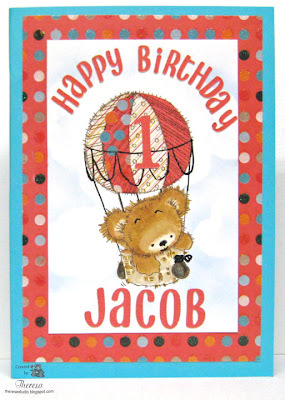 Jacob, my great-nephew, celebrates his first birthday on Monday and I want to send him a very special birthday card. 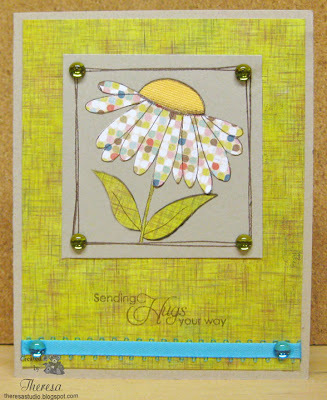 I used a LOTV's stamp "Patchwork Hot Air Balloon" that I stamped with Memento Rich Cocoa ink on White CS. I paper pieced the balloon and colored the bear with Copics. I masked the image and sponged clouds in the background. I cut letters and the #1 from adhesive backed CS with Cricut and attached to the card. I attached the image to a mat of glitter dotted CS and added to a Turquoise Card Base. The fun part of the card is the inside. ( See below) I stamped the bear inside and added a balloon of red honeycomb paper. 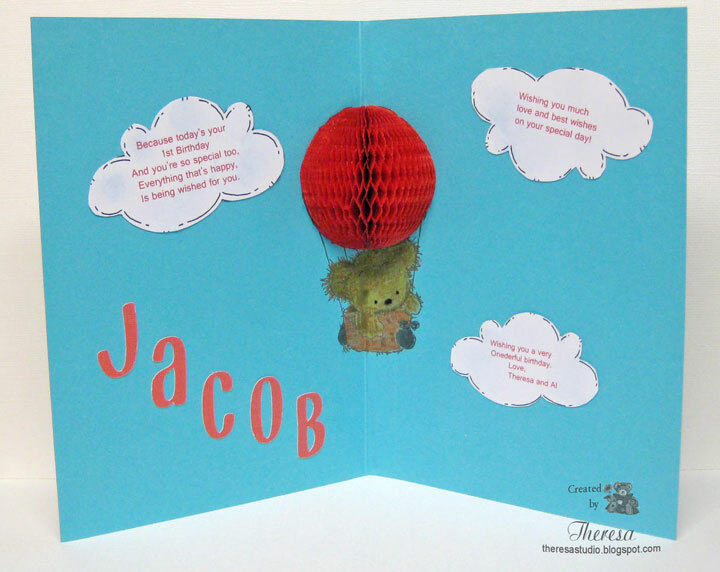 I surrounded the bear with clouds printed with best wishes and added Jacob's name. Clouds were printed on the computer. I used some new items on this card for the first time ....Cuttlebug Border EF Wicker Weave and a La Blanche Rose stamp. 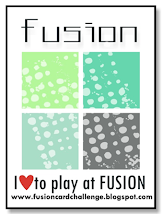 I won a Gift Certificate for Joanna Sheen at Fab 'n' Funky and purchased the stamp. 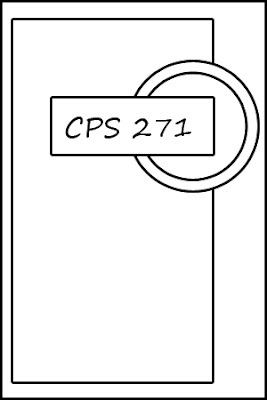 This stamp is so detailed and does not need much coloring. Used the frame die on the inside ...started with plan to use on outside card but ended up placing beneath the rose. use an Embossing Folder, use a die for an opening on the front of the card and use leaves as accents. Cheery Lynn Challenge: Use roses. Cheery Lynn dies used were Olive branches and Swedish Spring Oval Frame. Hope the stamped rose covers the theme. 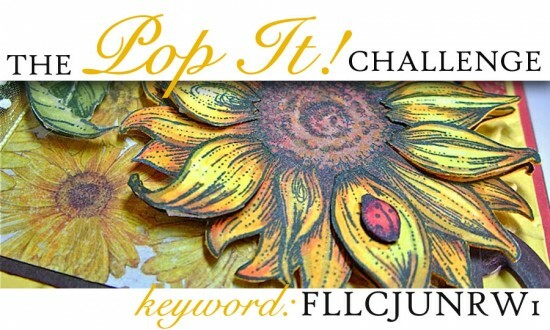 All you need is ten minutes and a dash of creativity to play in the latest Release Week Challenge At Flourishes. It’s one that gives you a chance to WIN their entire release for June! Check out the details here. For my CAS card that I made very quickly, I used a resist technique using a heat embossed image and sponged with distress inks. Added a bit of pink to flowers. 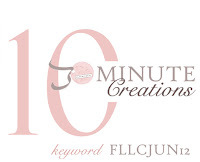 Congratulations to Julie on 5 Years of blogging!! I always enjoy time at the beach ...the sound of the waves, the warmth of the sand, and the cool of the breeze. I have tried to capture the feel of the beach in my card. I used Flourishes "Beach Life" stamp set. 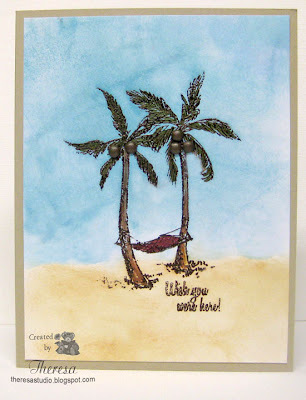 I stamped the sky and water with Memento Tuxedo Black and the sand and sentiment with Memento Rich Cocoa and colored with Copics B0000,B000, B01, E000,E00. Stamped birds with GKD "Gifts from the Sea". Sponged Memento Summer Sky on the sky. Added some white highlights using Distress Marker Picket Fence. Boat colored with red Glaze Pen. punch. Punched Cheery Lynn Fanciful Flourish in Glossy White CS and Cheery Lynn Butterfly and Spellbinders Scallop Heart in White to which I added touches of Memento London Fog ink. I stamped the heart with sentiment from Flourishes "Taglines". Arranged all the items with lace and pearls to finish. Father's Day is the challenge at FOSTV this week. I think a Father's Day Card should tell that person how special he is. My father passed away several years ago but I always have special memories of him at Father's Day and he was a Fabulous Dad. My card features the Special Lion stamp set from MFP. I stamped the lion with Memento Tuxedo Black Ink on a Tan Card stock from MFP twice and colored the details of the image image with pencils, glaze pen and distress marker. I cut out one of the images and cut only the center of the face of the second image that I attached to the full image with pop up dots to create a 3D effect. I hope you can see this 3D in the photo. I stamped a sentiment from the same set on to a pattern paper with Versamark and heat embossed with Copper EP. I cut the letters D-A-D with a Cricut and also heat embossed them with Copper EP and attached them with the Lion to the mat of Pattern Paper. I added the twine with a Lion charm to the mat and attached all to a base card of the Tan CS to finish the project. I like the effect of the Picket Fence White Distress Marker on the face....it is hard to see until the ink dries but it shows really white on the colored CS. 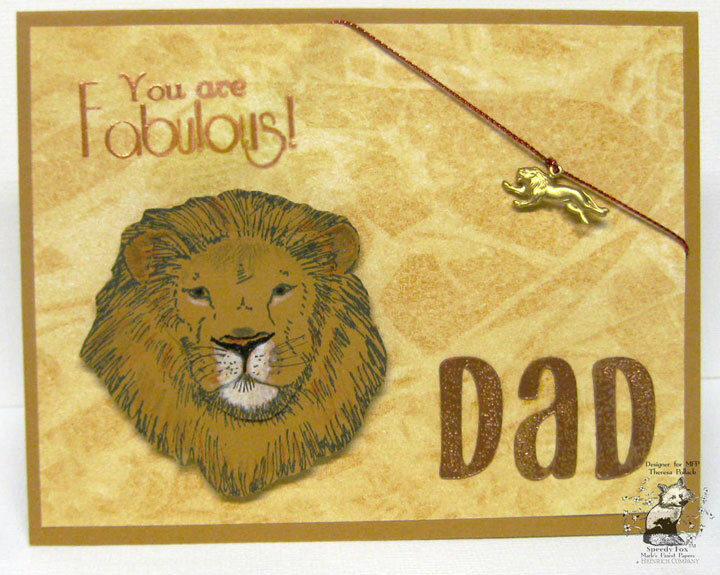 Stamps: "Special Lion" from Mark's Finest Papers, a Heinrich Co.
and a bow. Attached the black silk flower and a brad. This went on the card base of black. I followed a sketch from Tuesday Morning Sketches for my design. 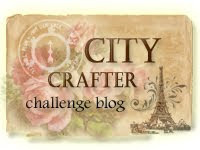 Paper Pretties : Monday challenge is use Bling. 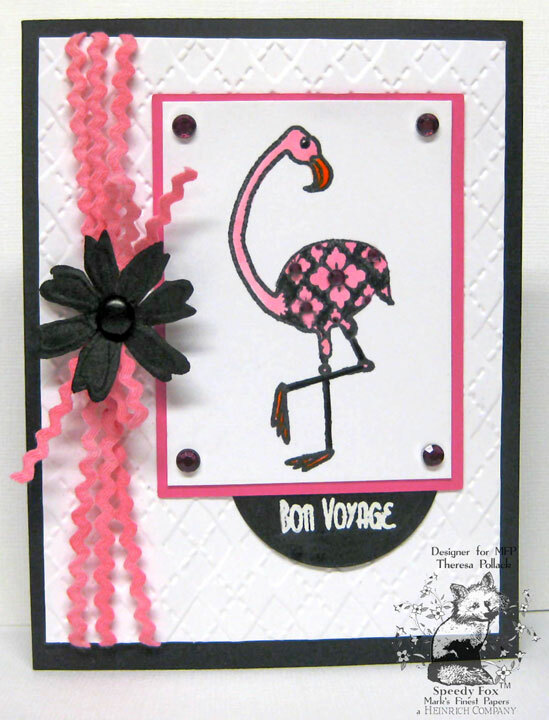 Charisma Cardz Challenge: Theme is travel-my card is a Bon Voyage card for someone traveling to Florida. Let's Ink It Up: Use your favorite embellishments. I used flowers, Ribbon (ric-rac) and gems(bling). 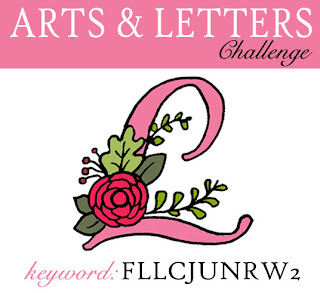 Really Reasonable Ribbon: Challenge is Flowers and Ribbon theme. Ric-Rac trim and black flower qualifies for entry. 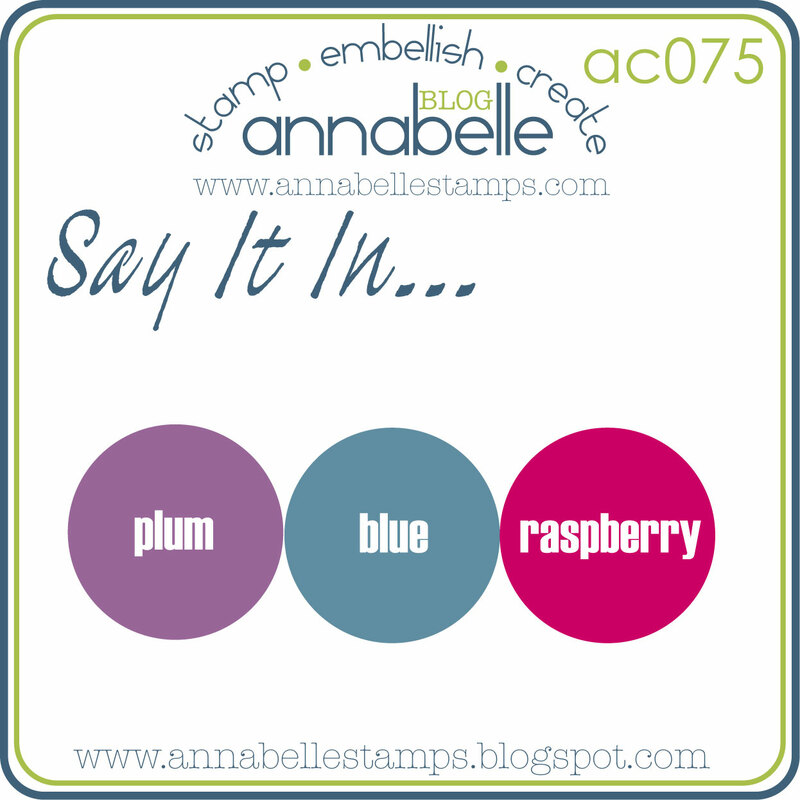 Please join in the challenge this week for a chance to win a MFP stamp Set. You have until 3PM on Friday June 15, 2012 to post your card. Remember, if you use MFP, a Heinrich Company stamps your name will be entered into the drawing twice. Don't you love it when a card comes together so quickly and you love the results? That's how I felt with this card for the challenge at Sugar Creek Hollow. 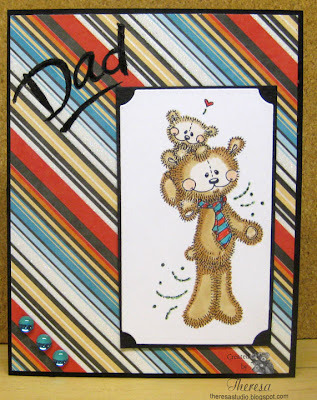 The challenge this week is to make vintage, shabby chic or primitive FATHER'S DAY cards. I had a hard time deciding what to make but when I found some very old paper of Antique Maps by PSX Papers in my stash ..(very old paper, probably old enough to be considered vintage) ... I knew I had to use it. 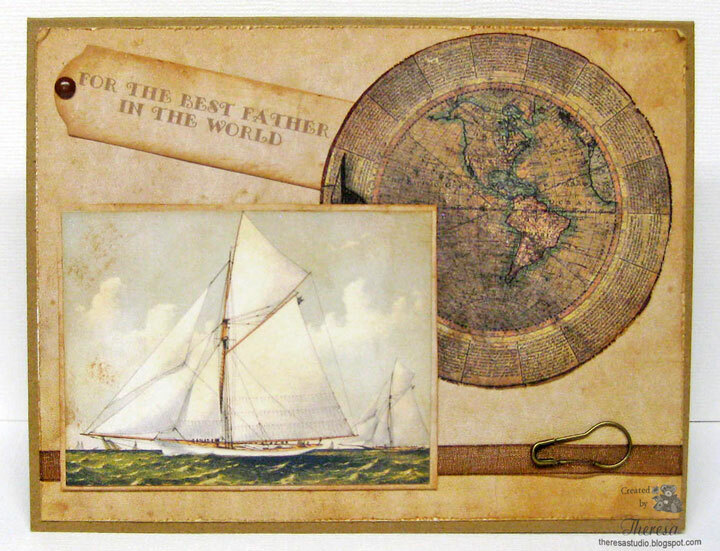 Then I remembered a couple of digital files that I saved from Graphics Fairy...a sailboat and a background paper with an "old" feel. I printed the Boat, Digi Paper, and added some distress inks -Tea Dye and Antique Linen-and distressed edges to all the layers including the map that I cut with a Nesties circle die. Assembled all elements on a card base of MFP's Tan CS with a sentiment, ribbon, brad, and bronze pin. 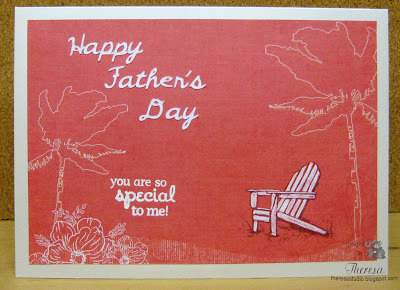 The sentiment "For the Best Father in the World" was computer generated and cut with a Spellbinders label die. Thought this tied in well with the "worldliness" of my theme. 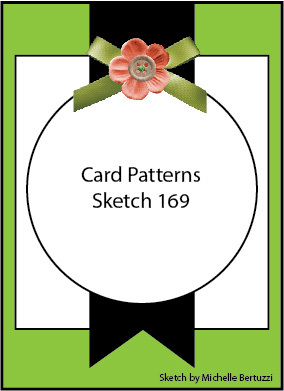 I made this card for a few challenges including Meljens Design and Card Patterns. 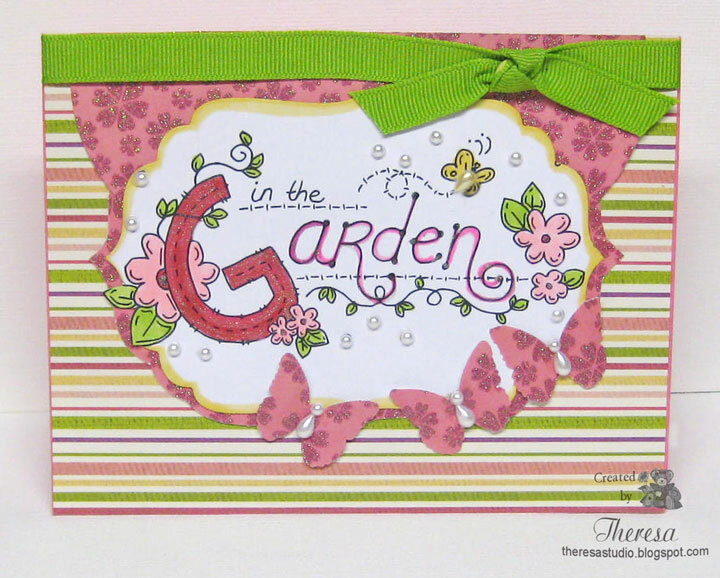 I sized and printed the digital image "In the Garden" and colored with Copics and Clear Star pen. I used colors that matched up with the stripes in CS. I cut the image out with a Spellbinders die and edged with yellow ink and matted with glitter paper. I added the punched butterflies with bodies of pearls and more pearls to the design. Assembled card with striped mat, half circle mat and ribbon. Added some sparkle with pen to the letters.